If you own or have ever owned a turtle, you'll know that some turtles grow quickly--and can get pretty big. The tiny hatchling you buy in the store might eventually turn into a dinner-plate-sized adult. When the turtles are small, finding a suitable tank is simple and inexpensive. As they grow, they need more space, which means a bigger tank and very likely lots of money for that tank. You can provide a big enough tank for your turtle while saving plenty of money by avoiding traditional glass tanks and using a homemade alternative. 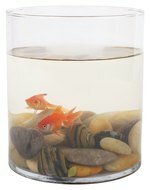 Plastic storage tubs (like the ones sold in mega marts) are excellent, inexpensive alternatives to traditional glass or acrylic tanks. These tubs come in a variety of sizes, from two gallons to 50 gallons, and range in price from $3 to $25. They do not need special stands and do not run the risk of breaking and shattering the way a glass tank does. You can even purchase one made of semi-transparent plastic to better see your pet. Keep in mind that these tubs are not designed to hold large amounts of water and if filled above half of the tub size, the walls might bow. You may have trouble getting a power filter to hang properly on the side of the tub. Also, thoroughly examine any tub for tiny holes or cracks that might leak. Another non-traditional option for a turtle tank is a stock tank, which can be purchased in feed stores or agricultural supply stores. These tanks offer less variety in shape and are not transparent. They are designed to hold large amounts of water and are extremely durable. Stock tanks come in sizes up to 300 gallons and cost significantly less than a traditional glass or acrylic aquarium. While these tanks are not as aesthetically pleasing as a glass tank, they will provide your turtle will all the room he needs to grow and live his day-to-day life. You might experience problems getting filtration systems to dit properly onto the stock tank walls, but by being creative a stock tank can save you money in the long run. There are other items your turtle tank requires, some of which can be homemade while you will just have to shell out the cash for others. A good filtration system, heater and basking lamp are imperative to your turtle's health. These can be purchased at your local pet store. Aquatic turtles require a basking dock, which can be made at home by cutting some cork bark or driftwood and wedging it into the tank or placing it on top of rocks, stones or PVC pipe on one side of the tank. Some turtles prefer/require a hiding place, which again can be fashioned from bark. If you have a land turtle, you might want to supply a few flat rocks for him to eat on at feeding time.